Lay out a piece of green tissue paper and then a piece of red over the top. Place the oasis (that's been cut to size) in the middle of the paper, and pull the paper up around the oasis, and place carefully into the box. Get one piece of cellophane and place a chocolate in the centre. Fold the cellophane over and pull in at the sides to enclose the chocolate. 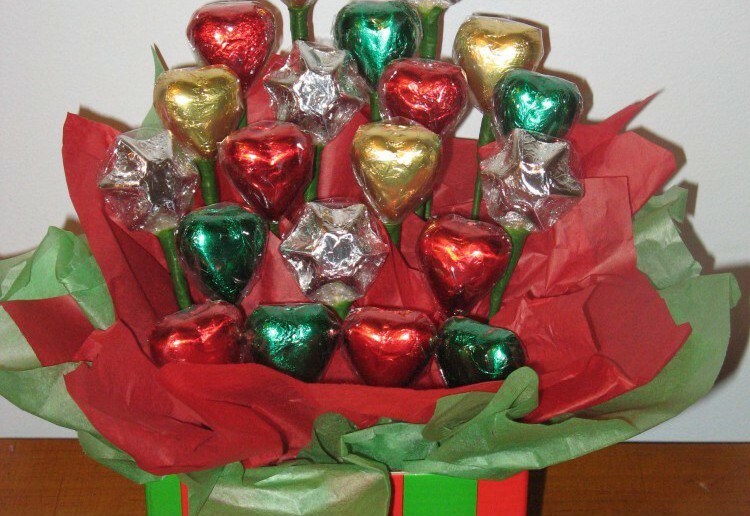 Holding the chocolate with the cellophane 'pinched' at the bottom, slide a wooden skewer up behind the chocolate, then carefully begin to wrap the florist tape or duct tape around the skewer tightly, starting at the top as close as you can get to the bottom of the chocolate, all the way to the bottom. Repeat this step for all the chocolates. Once all the chocolates are wrapped, begin at the back of the box, and carefully stick two of the chocolate skewers in to the oasis. Tier the chocolates by cutting the skewers to make them shorter so they sit lower as you get towards the front of the box. Once you are happy with the final design, cut some red tissue paper up into large pieces, and just push into the gaps around the bottom of the skewers to fill in the gaps and make it look fuller around the base. Notes... These look really good, and are relatively simple to make, you just need the time to assemble the skewers. I usually make a whole bunch of the skewers while watching tv and then do the assembly of the boxes all at once when I have time. While there is only 18 chocolates shown in this pic, there is actually 2 more at the back, they just wouldn't fit in the picture! Something a bit different is always good ! What a special present. Looks like it has come from the florrest. Thanks. What a greag idea. Might stqrt organising this now for my kids teachers. I know how quick xmas creeps up on us all. Thanks for the idea. Just what I was looking for, for an elderly Aunt in a nursing home! Thanks for the idea! Gorgeous gifts, thanks for sharing. I would love to receive a chocolate box like this one – looks fabulous and festive – love the pops of colour. We will be making these chocolate boxes as thank you gifts. I actually made one of these a couple of years back but I have to say yours is heaps neater than mine was. well done looks awesome. thanks for sharing. I would love to make your chocolate boxes and give it as a gift! Thanks! oh! It’s like a small flower box. So creative! !